I was fortunate enough to attend this year's quilt show at Houston. Among the many, many, MANY incredible items to tempt your credit card, was a length of the most magnificent batik I've ever seen. I got the impression that these batiks are new on the market, as several vendors had them in their booths. They are unbelieveably gorgeous. The company is called Bold Over Batiks and the fabric is a 2.5 yard length by about 38" wide. 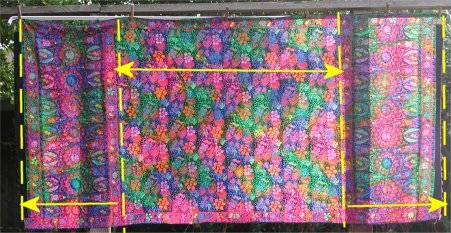 Each end of the fabric is a kind of "panel" ... 2 vertical borders that band a multi-colored batik. 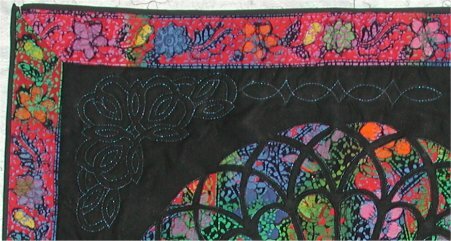 Between the 2 end "panels" is a very LARGE mutli-colored batik. Down each "selvage" of each 2.5 yard piece is a another border strip. You don't have to use the length of fabric as "panels" nor do you have to use the border strips *as* borders, but they are they if you want to. I paid $43 for the 2.5 yard length, which was about the going price at the quilt show. 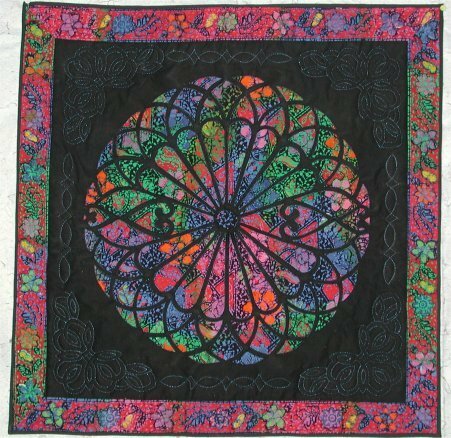 The vendor I bought the batik from had a wonderful sample of a Rose Window wall hanging, from a pattern company that I happen to have a couple of patterns from. I didn't have this particular pattern, so when I bought the batik, I also bought the pattern. The pattern is "Garden Gate" from Patchwork Studios. 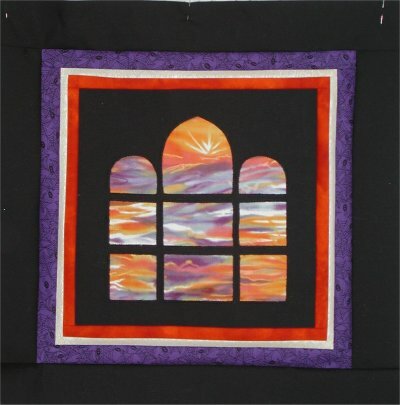 This company specializes in *easy* stained glass looking quilts. Sadly, it appears as of 2009, the "Garden Gate" pattern is no longer offered BUT do check out the link because there are many other patterns just as easy and just as beautiful. What I finally finished, is a truly wonderful Rose Window. I used the large central section of the batik and the selvage border strips. I still have the 2 end "panels" and their borders, plus a hefty amount of the center section leftover to do something else with. Here is a close-up of the corner quilting. I used Superior metallic thread in a sparkle blue. Here is what the batik fabric looks like: the single-headed arrows show the end "panels" (including their border strips); the double-headed arrow shows the large central section. What is less clear is that running down the length of each selvage is another border strip. The dark vertical shadows are just that .. shadows from the uprights when I was hanging the fabric .. they aren't part of the fabric. The background fabric needs to be one whose look you just love. The fabric can be a landscape, a floral, a novelty, a tie-dye, a marbled look .. really, just anything you think you'd like to see thru a window. The frame and leading lines are ONE PIECE OF FABRIC and are therefore the same color. 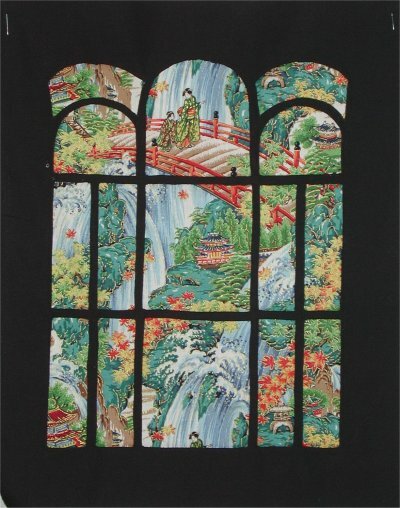 Windows are cut from this fabric to allow the background fabric to show through. You layer the frame/leading fabric over the background fabric and simple satin stitch over all the raw edges. It is just that simple ... and tedious. My Rose Window was boring, boring, boring to satin stitch; I nearly fried my one brain cell. Once the stained glass piece is constructed, you can then add additional, optional borders; decorative quilting; appliqued motifs. 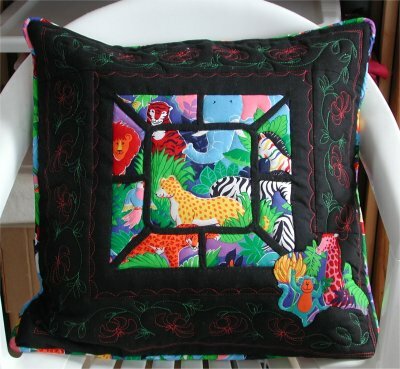 The stained glass piece can be sandwiched, quilted and used as a wall hanging; used a block in a larger project; made into a pillow cover.